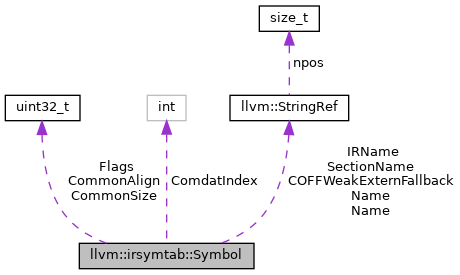 This represents a symbol that has been read from a storage::Symbol and possibly a storage::Uncommon. Definition at line 161 of file IRSymtab.h. Definition at line 183 of file IRSymtab.h. Definition at line 196 of file IRSymtab.h. COFF-specific: for weak externals, returns the name of the symbol that is used as a fallback if the weak external remains undefined. Definition at line 217 of file IRSymtab.h. Returns the index into the comdat table (see Reader::getComdatTable()), or -1 if not a comdat member. Definition at line 181 of file IRSymtab.h. Definition at line 210 of file IRSymtab.h. Definition at line 205 of file IRSymtab.h. Returns the unmangled symbol name, or the empty string if this is not an IR symbol. Definition at line 177 of file IRSymtab.h. Returns the mangled symbol name. Definition at line 173 of file IRSymtab.h. Referenced by llvm::lto::InputFile::getCOFFLinkerOpts(), and llvm::lto::InputFile::Symbol::Symbol(). Definition at line 222 of file IRSymtab.h. Definition at line 185 of file IRSymtab.h. Definition at line 191 of file IRSymtab.h. Definition at line 203 of file IRSymtab.h. Definition at line 201 of file IRSymtab.h. Definition at line 200 of file IRSymtab.h. Definition at line 192 of file IRSymtab.h. Definition at line 194 of file IRSymtab.h. Definition at line 189 of file IRSymtab.h. Definition at line 202 of file IRSymtab.h. Definition at line 193 of file IRSymtab.h. Definition at line 190 of file IRSymtab.h. Definition at line 169 of file IRSymtab.h. Definition at line 164 of file IRSymtab.h. Definition at line 168 of file IRSymtab.h. Definition at line 165 of file IRSymtab.h. Definition at line 163 of file IRSymtab.h. Definition at line 170 of file IRSymtab.h.